What I believe to be the real reason. Using an excerpt from Dennis' website and also found in many other locations. My plants went from growing roots through a plug and tapping into fertile "hot" soil and water column dosing to just water column dosing with an inert substrate. Now do I believe everything I read, absolutely not! Initially I believe nothing unless I find more articles that describe similar conditions. Did nutrient availability fluctuate in a big way, Yes! Can proteins etc..be ejected/found on plant leaves surfaces, Yes! Is this what happened in my tank? Not sure but it's a good story to tell! MG I tend to agree with this theory. I believe plants get settled in and make the best of what you are providing. Rock the boat too hard and the system is shocked. So then they need to reprogram everything and get settled back in again. It's very similar to what we have seen when a plant went from one our tanks to the other (dirt vs BDBS). Some made the transition, some didn't. We have even seen some morph into a very different looking/sized plant in their new environment. I think the lesson there is that it is best to make changes slowly when you can. Whenever I make a change, I phase it in over time (kind of like what you did with KH). Gives the plants some time to slowly adjust and avoid the shock. And glad to see things are calming down a bit. I'm really looking forward to seeing where things go from here. Very, very interesting transition, and I am sure more interesting things to follow. Maryland Guppy, Immortal1, SingAlongWithTsing and 1 others like this. I definitely think your story is better than mine! Greggz, Maryland Guppy and Grobbins48 like this. Just a theory on the root problem. Better to lay it all out there, people comment or ask questions. I provide answers and provide details. The scary part would have been if the plants didn't clean up with the algaecide. No work in the tanks today. Brief posts throughout the day. Wife had me outside, removing a stump, grading near the field (about 6 tons of excess dirt so far), metal grating over a grease trap (prevent my grandson from taking a dive), cutting up limbs in the rear yard, jump start 2nd tractor (sitting all winter), firing up the burn barrel for a spell. This will all continue into tomorrow. I will be making RODI water while working outside though. Yesterday 76°F, today 45°F with 28mph winds, wrong cup of tea for me! I did spend about 30 minutes in front of the tank this eve. 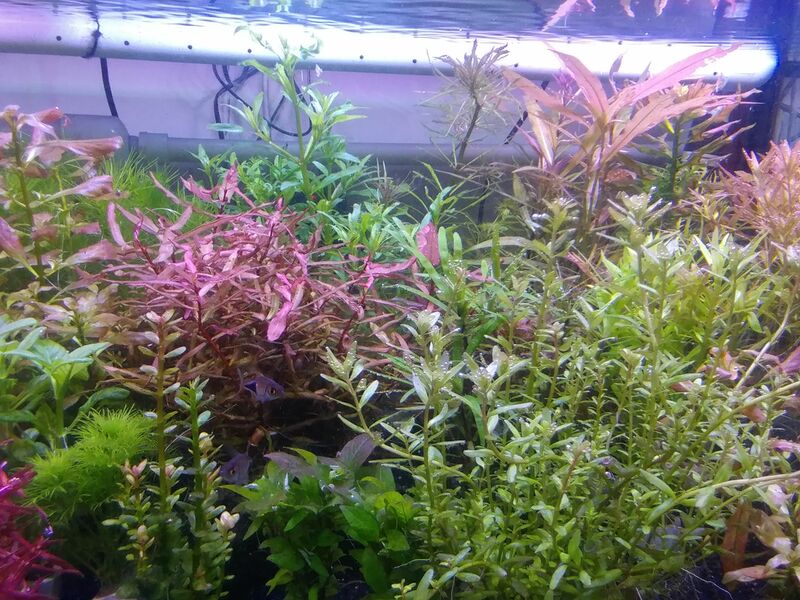 Just observing the plants and I will need a second algaecide treatment. 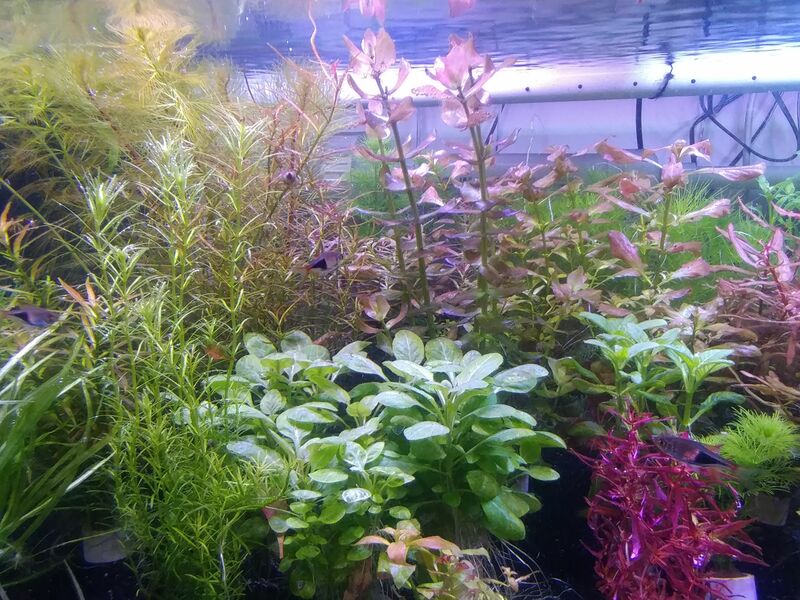 I feel that the plant density is too great and even though the flow for the tank is adequate it's not enough for the amount of plants contained within. 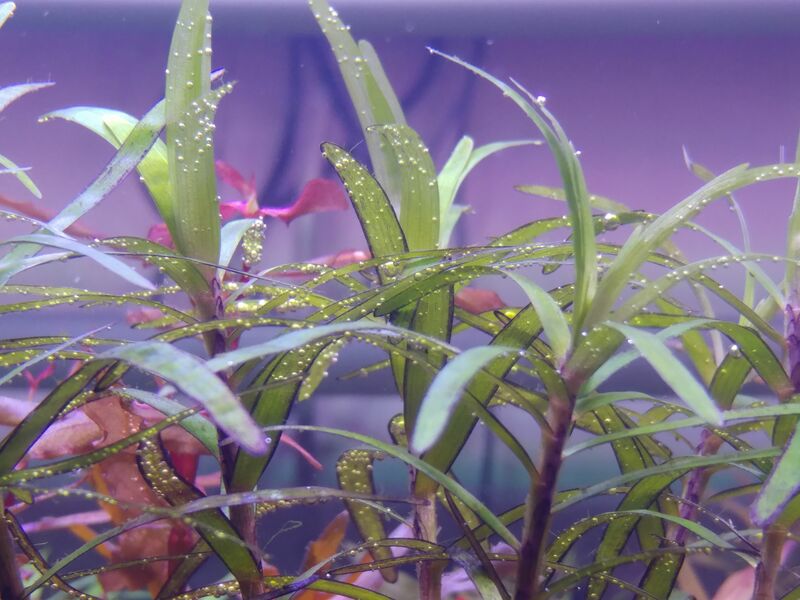 Don't read me wrong on this, plenty of growth with pearling. 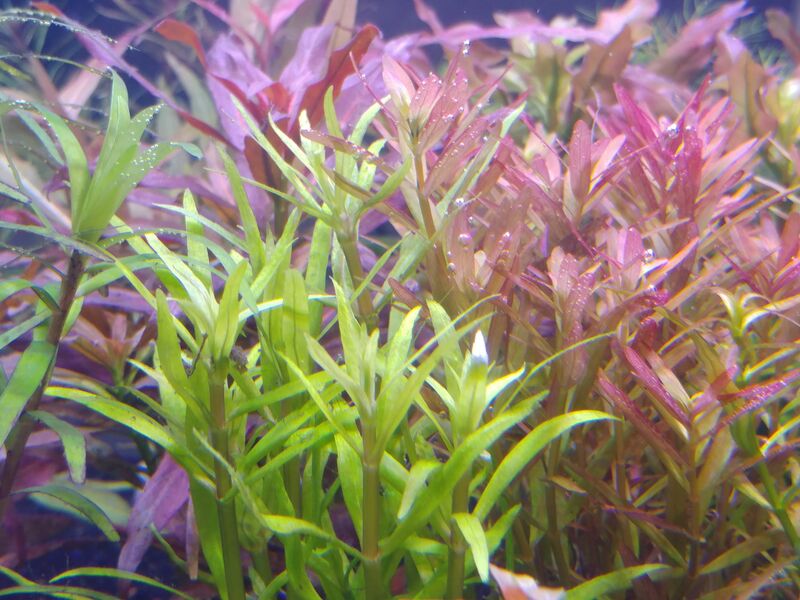 Still have green hair type algae, no where near as bad but a second treatment will knock it down. It's not even worth a pic but I'd rather have it gone for good. Greggz, LRJ, Immortal1 and 3 others like this. I know others have said this, but thank you for sharing the details of this experience! It is quite the interesting read, and even though this is likely not the most enjoyable experience for you it does a great job painting a picture of parts of the hobby that can get people down and want to leave. You are really showing people that things ebb and flow, and that even massive problems can be overcome with patience and a plan-- and a plan that can be adjusted and you lean more! Anyways, nice work, and can't wait to see the continued progress! Greggz, Maryland Guppy, Immortal1 and 1 others like this. 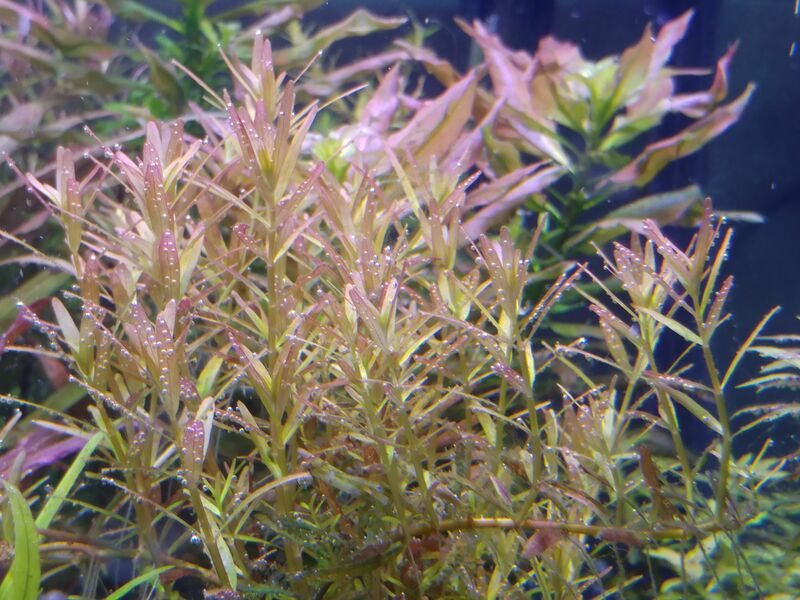 Algae covered it and the stems went horizontal within a day. Is this a sign of self-propagation mode from this plant. Now I'll have 50 stems of this in no time. My thoughts on the need of a second treatment come from viewing things like this. Maybe flow was a little weak in areas and some hair type algae remnants remain. There is a big difference in the cleanliness of these two pics. Seems like the algae bomb brought out a survival mode in some of the Pogos too. They are all sending out new plants @ several nodes. Will try and get a pic of this behavior too. Greggz, Immortal1, Grobbins48 and 1 others like this. Most plants are reaching the surface, nothing seems stunted. Still a bit of algae in a few places. Surface scum is slowly fading away. The ambulia that stunted was not the smoking gun. Need to pull the peruensis and see if the bottoms have went to crap. Greggz, ipkiss, burr740 and 4 others like this. One algaecide treatment seems to have done the trick. I'm holding off on doing a second dose for now even though I have spoken about it. @Greggz the only plant not liking this substrate change so far is S.repens. It has not melted away but it is surely not what I was growing before. Captain Immortal the atlantis seems fine, 5 little stems in a plug aiming toward the light. Some stems prior to the algae outbreak from @Bartohog all survived and are growing crazy big now. Even ammannia senegalensis has not missed a beat during this mess. During this algae outbreak I seriously neglected my 33G grow out tank. All ferts bottomed out in this soil tank and the growth went crazy. I've brought both macro & micro up to my liking and slowed things down a little. I know that doesn't sound right but it worked. 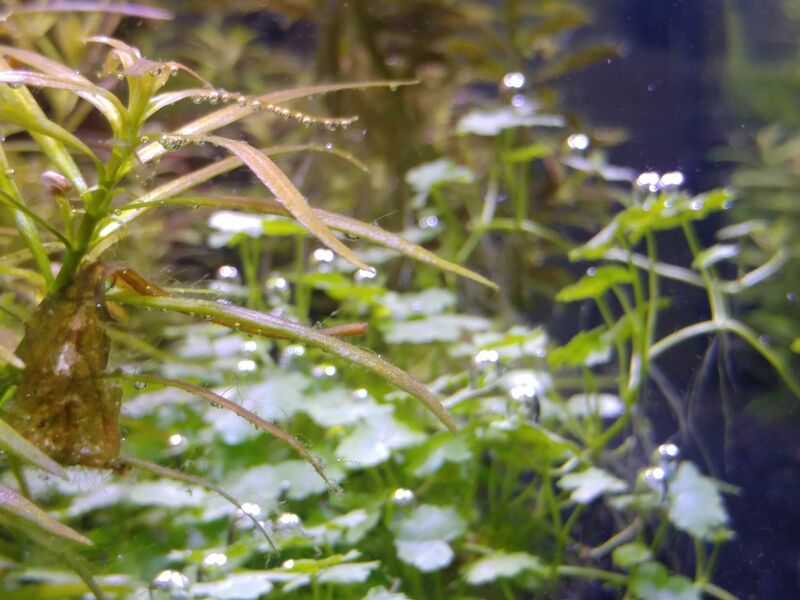 Some hydrocotyle tripartita japan and riccia has to go soon. It has reached an unmanageable state. Will get some pics over the weekend for sure! Greggz, burr740, LRJ and 3 others like this. 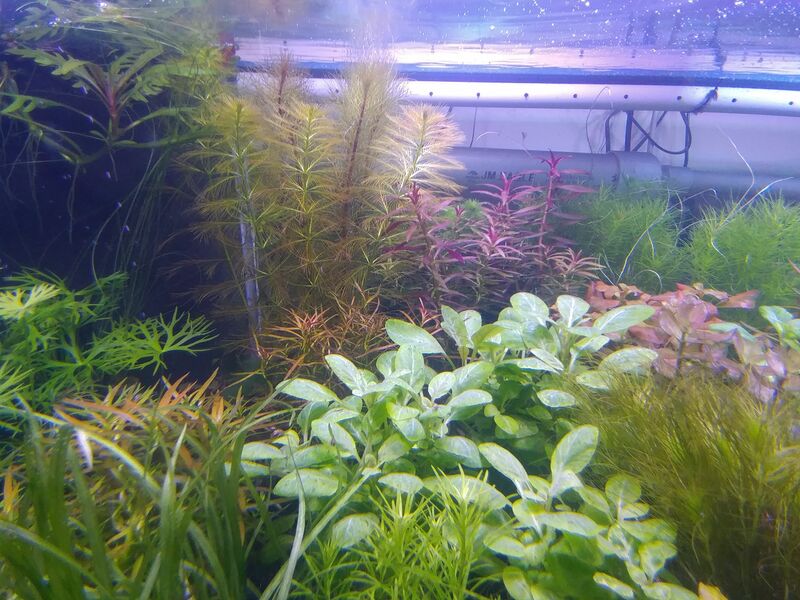 My S. Repens hates BDBS - the roots are so long and deep and it still just looks stunted and sad lol. It used to have longer lovely leaves that would reach up and then flatten out throughout the day. Bartohog, Maryland Guppy and Ken Keating1 like this. An update for some of you. Pogostemon yatabeanus a unique shade of green! Rotala rotundifolia is kicking it okay. Eichhornia diversifolia has fully recovered and the nodes are getting way closer together. Left third of the farm not looking too bad. @Greggz notice the Bihar growing roots into the filter foam upper left. 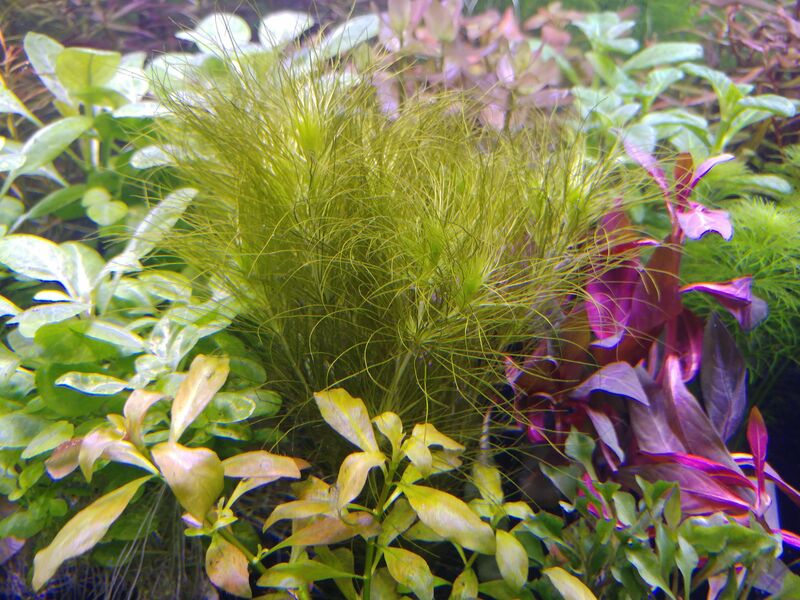 Ludwigia atlantis @Immortal1 right in front of hydrothrix gardneri @Chlorophile. Sorry meant to be Captain Immortal! Ironically the atlantis looks a lot like the ludwigia broadleaf in place here. After some observation my tank may be doing alright. Phish did not like AlgaeFix even in half doses. 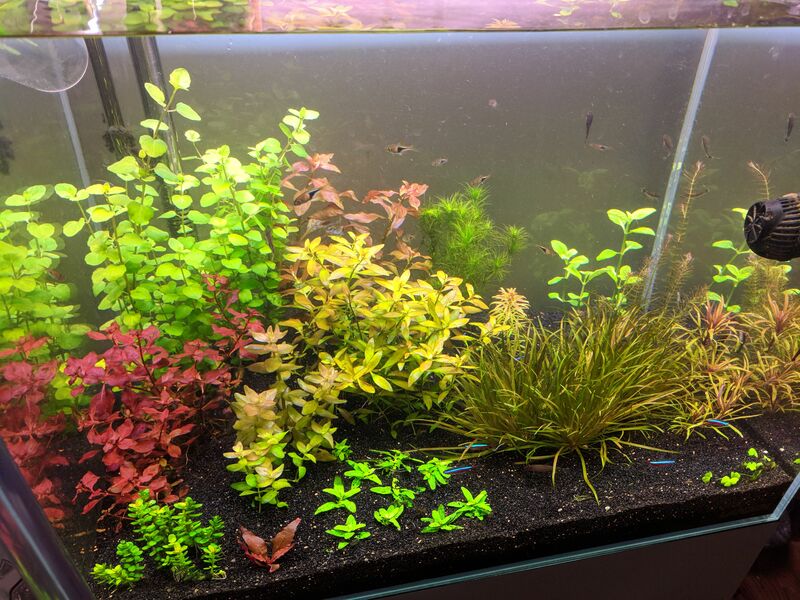 Had some hair type algae in my 33G tank, mostly on the rear glass. Dosing the algaecide for 5 consecutive days so far and nothing has happened. Very much unlike the grey pearling algae I posted from the 80G a few days ago. Wondering if once the seal is broken the effects diminish??? Traveling around Thursday I visited the LFS. New plants had just arrived, I am a sucker for punishment. 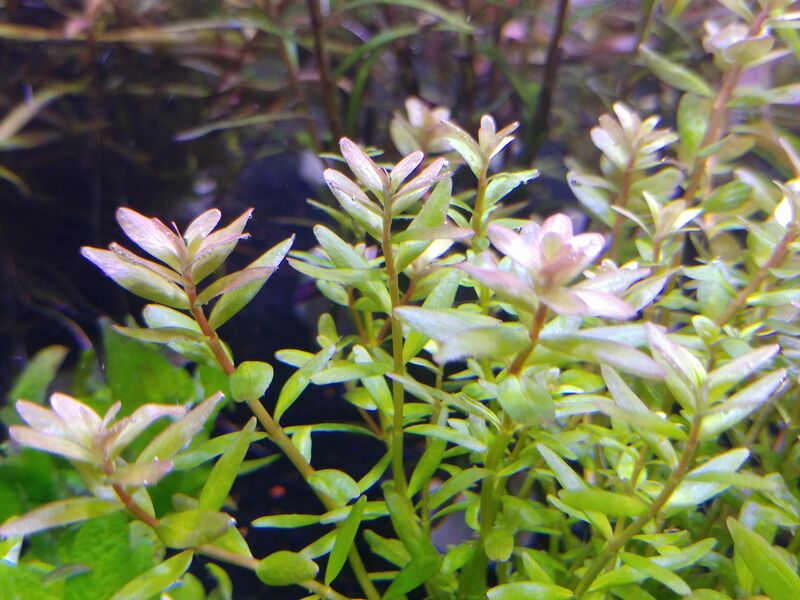 Brought home some luwigia peruensis diamond and AR variegated all emersed growth. No issues with the "diamond" typical type of emersed growth but the AR is another story. The AR is a very hard stalky stem in the green form, time will tell! Greggz, rzn7z7, burr740 and 3 others like this. Guppy, by chance will you be at the big PVAS auction upcoming? I would love to be there but my travels to the great state of Virginia have been rather rough. Way too many hours spent on the highway shall we say. Oh man you’d make a killing there selling plants. And yes I am looking for a few stems. 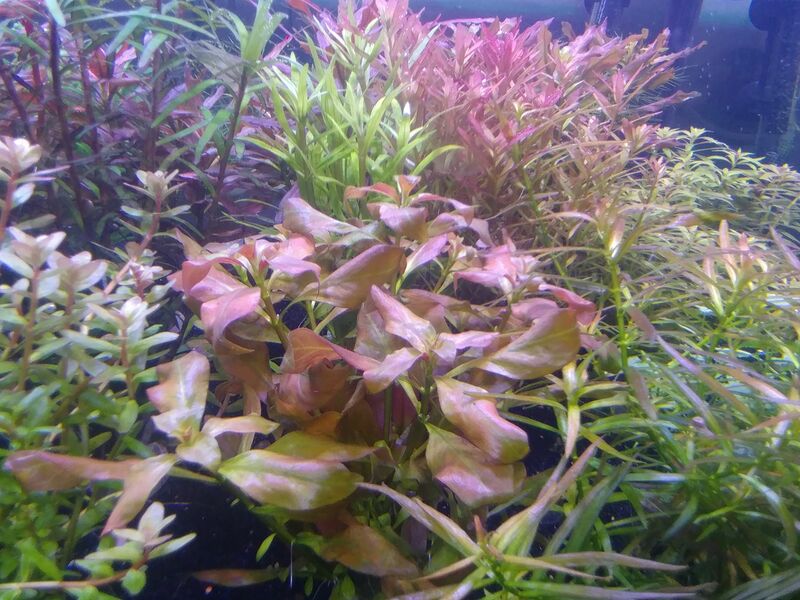 When you have them available some S. Repens if you have it and some Rotala. Let me know and FYI the tank looks great. Greggz, Maryland Guppy and Ken Keating1 like this. you can see it dead center, infront of L. Rubin. When it had more light it was more copper/bronze, with less light its yellow and a tiny bit pink. burr740, Maryland Guppy and Ken Keating1 like this.